The Buffalo Rock Company does not sponsor The Birminghamster. Buffalo Rock Golden Ginger Ale Delicious, Refreshing, Unique! West Oxmoor(JM) First developed as an experiment by grocer Sidney W. Lee and chemist Ashby Coleman in 1901, Buffalo Rock Golden Ginger Ale has proved over the course of a century to be a delicious, refreshing drink. "Taste the Difference"  proclaim the elegantly pebbled 6 ½ oz. bottle and distinctively colored 12 oz. can - and what a difference there is! Sharp tangy ginger flavor mingles with the kick of carbonation to lend this caffeine-free pop a sensational and refreshingly different taste reminiscent of ginger candy or candied ginger. Unlike other ales, Buffalo Rock Golden Ginger Ale is classified as a 'soft drink,' by the National Soft Drink Association. Soft drinks can be defined as "a fun means of refreshment," and are distinguished from so-called 'hard drinks' such as Smirnoff Ice and Bacardi Breezers by their lack of alcoholic content. Alcohol, of course, is what gives 'hard drinks' their mood-altering and mental-impairment qualities. Since prohibition, soft drinks have emerged as America's favorite refreshment. In fact, one of every four beverages consumed in America today is a carbonated soft drink, averaging out to over 57 gallons of soft drinks per year for every man, woman and child! With an enormous and unquenchable market like that, its only natural that niche products like Cheerwine or Pepsi Clear would assume their place alongside the more established brand names (Coca-Cola, Dr Pepper, Sams Choice). And it is in this context that we can appreciate the refreshingly different taste of Mr. Lees experimental creation. And dont forget, Buffalo Rock Golden Ginger Ale is not only a unique and delicious 'soft drink,' but is also used to relieve nausea and other mild stomach ailments. It is also great poured over vanilla ice cream or orange sherbet. 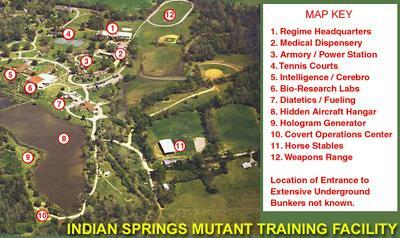 Indian Springs() Indian Springs School, the place local parents have always thought of as a highly selective college-preparatory school, has been revealed to be a secret mutant training ground. Students are not just selected for their academic abilities, but also for their latent mutant super-powers. Once at the school, director Mel MacKay trains students in the use of their powers while simultaneously providing a seemingly normal liberal-arts education. The mutants were finally exposed by a Fox 6 news crew. Reporter Nikki Preed had come to report on the uncanny number of scholarships received by this year's graduating class when she was witness to several mutant incidents. "I had half a box of Krispy Kreme doughnuts in the truck from earlier in the day," said Preed. "I noticed this boy messing around with the box. When I went to see what was going on, I found that the doughnuts were hot and fresh. I was a little freaked out so I only ate a couple." Preed later learned that the youth was known as 'Glaze.' According to the other students 'Glaze' had single-handedly tripled the Glee Club's take on their annual doughnut sale. Later, Preed thought she had a scoop on drug use at the school when she detected the unmistakeable scent of pot coming from the horse stables. "By the time I got there I could detect no smoke, and no smell either," said Preed. "I heard all the kids congratulating 'Smoke' on another job well done." A little research into the history of the school brought more questions than answers. It turns out that an investigation was launched in the 50's, just after the school had opened. Police had been called several times in response to threats made by someone called 'The Mad Bomber,' a criminal mastermind whose identity has never been revealed. Then one day, the reports just stopped. Then basketball coach Fred 'Colossus' Cameron convinced Sheriffs that the problem had been solved internally, but suspicions remained. Eventually all of the assigned investigators either retired or went insane. Contacted recently for this story, a former deputy by the name of Randolph Nesbitt produced a stack of seemingly unrelated documents he has collected about the Indian Springs facility over the years. He dusted off an old Glee Club recording and warned me to hold my ears. "This was a recruiting tool they used to use. There's a supersonic message embedded in the vinyl which only those with mutant powers can hear." Parents expressed disbelief about the goings on at Indian Springs and were unsure of MacKay's role. "Director MacKay was such a nice man," said one mother. "He told me that he would take care of my son and make him into a man. He also said I made delicious fried chicken. He really had me under his spell." Other parents, especially fathers, were not so sure about their visit from MacKay. "I remember sitting at the dinner table, talking about what Indian Springs would mean to our daughter, and the next thing I knew MacKay was leaving and I found my wife in the bedroom with a headache." While not a mutant himself, MacKay is reportedly able to manipulate people's thoughts using an alien-constructed apparatus attached to his head. Mutant powers among the student body are rumored to include speed-reading, superhuman strength and endurance, control over elements of nature, extreme sportsmanship, and superhuman resistance to powerful psychoactive drugs. Many of Indian Springs' alumni have gone on to serve in the U.S. Government in astonishingly high-ranking positions. Others have disappeared from public records without a trace. Neighbors to the sprawling campus have become accustomed to strange lights and mysterious sounds - usually ascribed to late-night games of 'Soccer' [An exotic fast-paced sport played with a round ball by players whose arms are bound tightly to their sides] which has been popular on campus since it was introduced by Ray 'The Woodsman' Woodard. Montgomery() A solution to Alabama's education funding woes was found Tuesday during a routine cleaning of the governor's mansion. 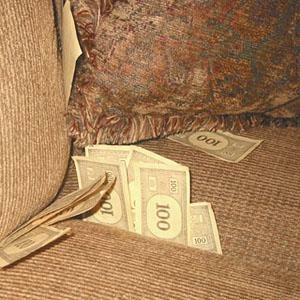 In a Mitchell Gold sofa next to the wet bar, the cleaning crew discovered $400 million in loose change. The money was found by Thom Trhan, a non-english speaking Republican. "I heard Thom exclaim loudly, and ran over from where I was cleaning the rifles," said mansion Chief of Staff Jill Wyman. "I was so stunned by what I saw that I almost dropped the gun oil." Governor Bob Riley immediately held a press conference to announce that the education shortfall had been eliminated. "We asked everyone and nobody claimed the money," said Riley. "We will just have to keep it and use it for education." The governor has not decided whether or not to use the sofa as a permanent source of funding. "Depending on what happens in the future, we may not have to raise any taxes at all," said Riley. "And I don't mind continuing some of these no-bid contracts, as long as this sofa funding doesn't dry up." Riley shrugged off questions when asked if this wasn't just another short term solution to a long term problem. "If you had to look at this mess everyday like I do, you'd be praying for a loose sofa too."